Until recently, the evolution of the entrepreneurial work-at-home experience went something like this: First a small space–maybe just the kitchen table–would be carved out to chase a new opportunity. With luck and hard work, the business might grow significant enough to take over a dedicated space, like a spare bedroom, a corner of the basement or that room above the garage. Eventually, if the business really took off, it would outgrow the confines of the home office and move to a dedicated business space. Today, though, technology and a growing awareness of the need for intelligent home office space have combined to change those dynamics. 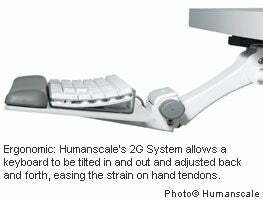 New ergonomic work tools transfer the benefits of dedicated work spaces to home environments. Advanced wireless networking brings full connectivity to any room. And a changing society has blurred the lines of where it is acceptable to do business. Working from home took off in the 1990s, when laptops and mobile phones made telecommuting viable. Companies often looked to save on rent by giving workers a stipend to set up shop from home. Inexpensive modular pieces were shoehorned into cramped, ad-hoc home spaces with middling results: Hands ended up tilted at awkward positions, leading to repetitive stress injuries and a bum rap on working at home. Take care of yourself. Think ergonomics first. Choose a keyboard that tilts in and out and can be adjusted up and down as well as back and forth.Humanscale’s 2G System ($419) is a solid pick. When you’re typing, make sure your hands tilt downward to ease the strain on your long manual tendons. And for tasks like web surfing and research, noodle the keyboard around until it feels comfortable. (Surprisingly, experts say desk height doesn’t really matter; the keyboard is what should adjust to your needs.) Your chair should be all about flexibility and support. 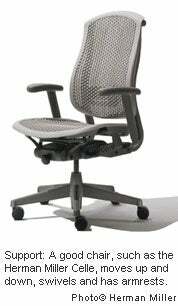 A good entry-level model like the Herman Miller Celle Chair ($449) should move up and down, swivel right and left. It should have well-placed, adjustable armrests; and don’t forget your head–your neck and lower back are all part of a (potentially painful) piece. Every (small) thing in its place. Most office furniture is too big for homes. Look for a smaller, L-shaped desk instead of the traditional square. Then put the monitor directly in front of you at eye level and everything else–computers, peripherals, etc.–off to your right or left. Also, avoid sitting directly in front of a window. Yes, the view is nice, but the contrasting light confuses your retina, which can give you a royal headache. You can’t make money that way. Light it up. Task lights are great in the kitchen or for reading, but these direct, down-facing lights should be banished from the home office. They create glare on the screen, which can tire your eyes. Instead, bounce light off the ceiling or wall and give your work a cool bath of indirect illumination. For best results, choose a light you can point and spin depending on the time of day. Check out the personal desk lights with efficient LED bulbs from Group Dekko. Get moving. Don’t make things too accessible. Without that water cooler chat to pull you way from your desk, you will need to build in excuses to stop typing and move around. Use a next-generation wireless technology like the Netgear N300 Wireless dual band router ($99) to put the printer in another room. And then jack in a high-quality, cordless headset like Plantronics T20 ($80) that lets you make calls from the couch or the deck–or better yet, the exercise bike. The bottom line: A home office can be not only as efficient, but potentially even more efficient than a dedicated out-of-home space. Never mind the zero spent on commuting or the savings on dry cleaning, there are real tax advantages as well. Done right, your home office can make money for you, even when you don’t. Productivity bonus: If you have a good chair and keyboard, a perfectly functioning fold-down work space can be attached to something as simple as the back of a solid core door. You may not need a dedicated office at all.